Apple Computer on April 18th filed for a trademark on the phrase "Jam Box," which seemingly refers to the controversial FireWire-based Asteroid breakout box that has become the center of an ongoing lawsuit. 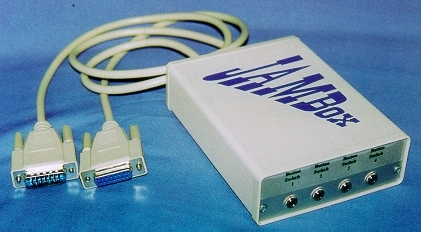 In the filing with the United States Patent and Trademark office, Apple describes Jam Box as "computer hardware; computer software; computer peripherals, namely audio production systems comprised of computer hardware and software for composing, recording, creating, converting, enhancing, processing, amplifying, mixing, manipulating, and playing audio signals." My guess would have it comeing out at WWDC. Why WWDC? The only way that would happen would be if there was something unique about "Jam Box" that developers would need to know. I'm betting that this device is announced one of these tuesdays. If apple had 2 models, the basic 2 input model and a 4 or 6 input model, that would be very neat. I don't expect to see anymore hardware announcements at WWDC. It's not a tradeshow in the vein of a Macworld. There are geeks everywhere but they like the programming toolz. If Apple wants to announce Jam Box to an appropriate audience they'd do well to announce at Summer NAMM Show July 22-24th. Bunch of geeky musicians there who'll lap this stuff up like a kitty on whole milk. I for one would love a nice little firewire box for Audio I/O. haven't looked at their firewire offerings in a few months, i will go checky it outy nowy. There used to be a MIDI interface called the JamBox/4, followed by the JamBox/4+ etc. It was the first multi-port MIDI interface on the market and it was Mac compatible. I remember using one with the Mac Plus in the studio I was recording at. Interestingly it wasn't the most stable piece of hardware in the world, and it would often be referred to as the "Jammed Box" by the studio's proprietor/engineer. I wish I could remember the name of the company that created it. I'm quite sure they no longer exist, however. It is the World Wide Developer Conference. JamBox (assuming it is some kind of iLife/Garage Band doohicky) is not targeted at this audience. Think Airport Express here. Apple stunned everyone with the introduction of Aiport Express "out of cycle" from a major event (June 7, 2004). I suspect JamBox will be similar. Less and less is oriented around major events like MW and WWDC. This is good. A device like this probably doesn't warrant it either. There seems to be at least two software programs out there called JamBox. In addition, "jambox" seems to be a slang name for any music player, similar to "boombox". I don't think the space will be enough to make it distinctive. This looks like a quagmire to me. What's wrong with "iJam" other than the connection to that crap you rub out of your eyes every morning? Because obviously, a UK magazine would have inside information like this, being extremely close to Apple headquarters. Seriously, why would Apple bother filing a lawsuit against Asteroid leaks when they don't even care to release the product? Why, furthermore, would they waste R&D on a product like this? well, macuser uk is one of the oldest mac magazines. the small article talks about apple working through every component in the device trying to see if they could save money because they wanted to sell for $120 and still keep their profit margin. they couldn't do it. if it is true it will not be the first time apple has come close to releasing a finished product after spending a lot of time and money. and it won't be the last.